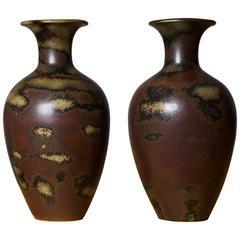 A decorative collection of five ceramic vessels by two of the most celebrated Swedish 20th century ceramists Carl-Harry Stålhane & Gunnar Nylund, in brown color tones and various shapes. Manufactured by Rörstrand Ab, Sweden, circa 1950s. Material satin-glazed stoneware. The collection includes following pieces: - Item nr. 1: Tall vase/floor vase 36 h x 13.5 dia cm. Designer Carl-Harry Stålhane. Rare model. - Item nr. 2: Narrow vase, 29.8 h x 7 dia cm. Designer Carl-Harry Stålhane. Model initials SYT. Designed in c.1958. - Item nr. 3: Flat vase (dark brown) 21 h x 17.4 dia cm. Designer Carl-Harry Stålhane. - Item nr. 4: Vase (light brown, Gunnar Nylund) 25 h x 16.5 dia cm. Designer Gunnar Nylund, marked NYLUND. - Item nr. 5: Small vase, 15.2 h x 13.9 dia cm. Designer Carl-Harry Stålhane. Model initials CEB. 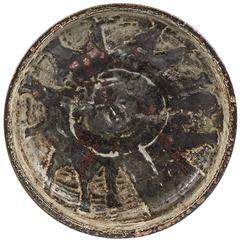 Each piece marked underside with manufacturer's mark, designer's mark CHS or Nylund and some with respective model initials. Brown satin-glazed stoneware. Good condition, some minor wear and marks due to its age. Literature: Stålhane (Petter Eklund), pg. 44 (model SYT). Midcentury Swedish vase by Rörstrand, designed by Carl-Harry Stålhane. This tall and minimalistic vase has a excellent glaze and is in very good vintage condition. Very nice large vase from Rörstrand and maker/designer Carl Harry Stålhane. Made in Sweden in the midcentury. Beautiful glazed vases in good condition. 3 wonderful pieces designed by C.H Stålhane at Rörstrand Factory in Sweden, 1940s-1950s. Good condition. Measures: H 26 D 9, H 16 D 6, H 17 D 9 cm.